One of the simplest ways to make sure your PC runs as efficiently as possible is to defragment your hard disk, and Smart Defrag is a great way to do it. Smart Defrag 2 is such a FREE tool that provides extremely fast and efficient defragmentation to your hard drives intelligently for faster file loading and high disk performance. With “install it and forget it” feature, Smart Defrag 2 works automatically and quietly in the background on your PC, keeping your hard disk running at its top speed. This powerful, award-winning free defragmenter is 100% safe and clean with no adware, spyware, or viruses. · Install it and forget it. This powerful, free utility works continuously, automatically and quietly in the background on your PC. Its intuitive interface makes IObit Smart Defrag the ideal utility for complete computer dummies. · IObit Smart Defrag has the world’s fastest defragmenting engine. It’s been specially designed for modern, large hard drives, so it eliminates long waiting times. · IObit SmartDefrag doesn’t just use simple defragmentation. It also streamlines your file system, enabling your computer to run at top speed with the most stability. · IObit SmartDefrag works automatically and quietly in the background, so it continually and constantly keeps your computer fragment-free. 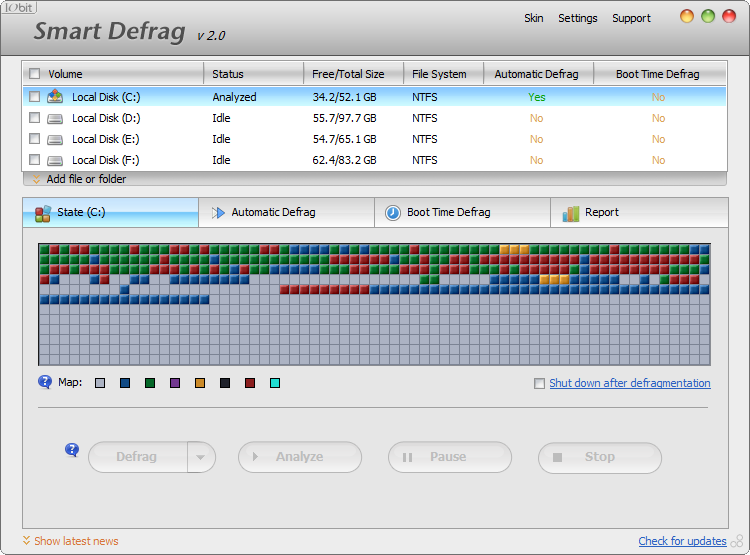 · Besides, unlike other “Automated” Defragmenters, Smart Defrag does NOT constantly perform analysis and defrag, which does damage your hard drive and shorten its life. Smart Defrag has a “Safe Intelligence” technology that can assure the health of your disk by deciding When and How to execute defragmentation. Does anybody know some free date calculator, which can exclude weekends and holidays from calculations ? I’ve foun one, but it is commercial.